Alfred Owen Webster Webster-Jones was the son of a publican and a solicitor by profession. He was commissioned in May 1915 and killed at the Battle of the Ancre in the Somme on 13 November 1916. Alfred Owen Webster Jones was born at 6 Blomfield Street, City of London on 27 April 1882, the eldest child of Alfred William Jones (1851–1926) and his wife Elizabeth née Webster (1857–1910). Alfred William Jones was born in Cambridge where his father, Owen John Jones, was the cook to the Fellows of St. John’s College from 1846 to 1871. In January 1873, he was admitted into The Vintners Company, where his father was also a liveryman. At the 1881 census, Alfred William Jones was the licensee at the City Arms at 6 Blomfield Street in the City of London, close to Finsbury Circus and Liverpool Street Station, with a live-in staff of seven. On 16 June 1881, at St. Stephen’s Church, Shepherd’s Bush, Alfred married Elizabeth Webster, the youngest daughter of the late Henry Webster (1811–1875), an optician, and his wife, Martha. The couple’s first child, Alfred junior, was born at 6 Blomfield Street on 27 April 1882, followed by Edgar in January 1884. Alfred junior was registered at birth as “Alfred Owen Webster Jones” with his mother’s maiden name as a third Christian name. By the spring of 1888, when Elizabeth’s daughter Dorothy was born, the family had left Blomfield Street and moved to 31 Aubert Park, Islington close to the location of Highbury football stadium, which was built in 1913. The family were living at Aubert Park at the time of the 1891 census, when Alfred William Jones described himself as a “licensed victualler”. By 1901, the family had moved south of the River Thames and were now living at “St. Margaret’s”, 33 Lytton Grove in Wandsworth. Alfred senior, aged 49, now described himself as a “retired wine importer” – the family had now come up in the world and had two live-in servants, a cook and a housemaid. On the 1901 census, Alfred junior, aged 18, was a solicitor’s articled clerk. Elizabeth died in 1910, at which time the family surname was still simply “Jones”. By the 1911 census, however, the family were all recorded as “Webster-Jones”; presumably, Alfred had adopted his late wife’s maiden name as a mark of respect. In 1911, now a widower, Alfred senior was still living at Lytton Grove with his two younger children and a nephew, Basil Fitch-Jones a 26-year old architect, plus a cook and a parlourmaid. Alfred junior had now qualified as a solicitor and in 1911 was living at “Haslingfield”, 127 Dorset Road, Bexhill in Sussex with his uncle, Edward Fitch-Jones, Basil’s father. Edward was Alfred senior’s younger brother, and was also a wine merchant. He had been given his mother’s maiden name as a Christian name, and added it to the family surname by deed-poll in 1902. With the change of the family name to Webster-Jones in 1910/11, Alfred junior’s full name became “Alfred Owen Webster Webster-Jones”. Alfred was educated at Holmwood School and afterwards at St. Paul’s School, Hammersmith and then University College, London. From 1900 to 1906, he served his articles with Gill, Pugh & Davey, solicitors, of Earls Court Road, London, qualifying as a solicitor in November 1906. Once qualified, he moved to Bexhill and practiced at 4 Bank Buildings, Hastings. In August 1912, Alfred was appointed organiser in the Hastings and Bexhill district for the Legion of Cyclists, with the intention of mapping the area to identify “every path or byway available to motorcyclists … as will be of use to any defensive forces occupying that neighbourhood in time of warfare”. Alfred’s father was initiated into Hyde Park Lodge No 1425 in November 1894, resigning in May 1900, before he joined Byfield Lodge No 2632 in March 1901, then meeting in the Great Eastern Railway Hotel, Liverpool Street. Alfred’s uncle, Edward Fitch-Jones was also a Freemason, having been initiated into City of London Lodge No 901 in February 1893, but resigned in December 1898. Curiously, both brothers gave their address at the date of initiation as Bolton Hotel, Earls Court. Alfred was initiated into Abbey Lodge No 1184, meeting at the Great Hall at Battle Abbey, on 20 February 1913. He was passed to the second degree on 27 March and raised to the degree of a Master Mason on 24 April 1913. Alfred enlisted on 14 September 1914 at Bexhill, joining the 20th (3rd Public Schools) Battalion, Royal Fusiliers as Private 1062. In April 1915, he applied for a commission and was gazetted as Second Lieutenant in the 3rd Battalion, Oxford & Bucks Light Infantry on 9 May 1915. A draft of 95 privates conducted by Lt. A. O. W. Webster-Jones Oxf Bucks L Infantry joined the Regt. on transfer from 6 / R. Berks. Regt. The C.O. was very critical of the draft, saying that “many of these … were called up in June 1916 and had been originally enlisted in the RGA. Knowledge of drill unsatisfactory, especially handling of arms”. Alfred returned to the reserve on completion of this duty, but re-joined the battalion on 19 October at Arquèves, to be posted to ‘A’ company, following which they marched to billets at Mailly-Maillet, 15 km due east. The battalion spent three days in the trenches from 25 October, with a futile attempt being made to cross No Man’s Land and capture a German sentry “in order to get an identification”. On 9 November, the battalion moved into the Redan sector of the trenches, with ‘A’ company in the support line. The weather was now fine, with “the wet condition of the trenches changing to one of heavy sticky mud, which made progress even more difficult”. On 12 November, ‘A’ company took up their position in “Valade” Trench ready for the major assault planned for the next morning. The weather had caused the planned assault on the German salient between the Albert-Bapaume road and Serre, centred on Beaumont-Hamel to be much delayed. Preceded by seven days of artillery bombardment, the attack was launched in darkness and thick fog at 5.45 am on Monday 13 November 1916. Generally, the attack was a failure with only limited gains. 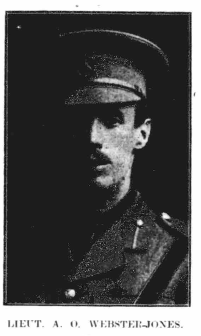 Alfred Webster-Jones was killed in the initial attack on 13 November 1916. The report in the Hastings & St Leonards Observer of 23 November 1916 states that he was “shot through the head while gallantly leading his men in action”. His body was never recovered and he is one of over 72,000 casualties with no known grave who are commemorated on the Thiepval memorial, approximately 5 km from where he was killed. He is commemorated on the war memorial at Bexhill-on-Sea, as well as on the Masonic Roll of Honour. Alfred’s younger brother, Edgar, served as a lance-corporal in the City of London Yeomanry (later part of the Machine Gun Corps) during the war, seeing service in Gallipoli and Egypt. He survived the war and was later employed as an Intelligence Officer with the Department of Overseas Trade. Two cousins, Owen Edward Fitch-Jones and his younger brother, George, were both killed in the war. Owen was a Lieutenant with the Royal Field Artillery and was killed at Ypres on 13 May 1917, aged 34. George was a sergeant in the Army Service Corps, attached to the 2nd Anti-Aircraft Workshop, and died of wounds at Bailleul on 6 January 1916, aged 30. LightBobs (The Oxfordshire & Buckinghamshire Light Infantry) The Somme Sector – The Battle Of The Ancre. WO 95/1431/1 War diaries: 5th Infantry Brigade: 2nd Battalion Oxfordshire and Buckinghamshire Light Infantry. Portrait: Bexhill-on-Sea Observer 25 November 1916.